In our family, we don’t eschew Halloween candy. All thing in moderation, right? It’s easy enough to count carbs when you are purchasing the candy yourself, but it’s a bit more work when your kid has a large haul procured from the neighborhood. Our larger issue this year is the stupid nut allergy. 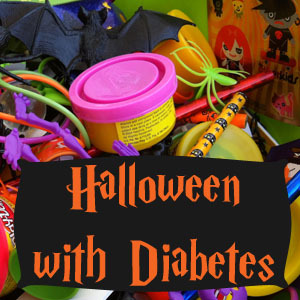 With just diabetes, we just have to count the carbs and give the appropriate insulin. With a nut allergy, you have to make sure your child isn’t exposed to a food that could possible cause an anaphylactic reaction! Here are a few things I picked up at Target, though I’m sure they are widely available. 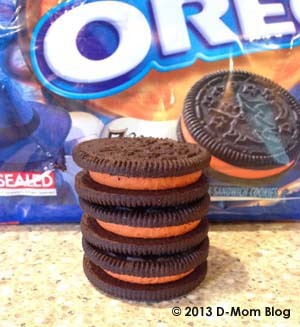 Okay, I’m not for one second saying that Oreos are one bit healthy, but they are nut free and dairy free. They don’t contain nuts, but there isn’t a cross contamination warning. The folks at Snack Safely list them as a “safe” cookie. 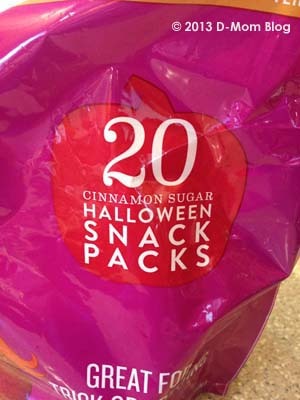 Here is Snack Safely’s Halloween snack guide. We’re actually serving these as the only treat (everything else is healthy) at my son’s class party because of allergies. I know Q will want some candy in her lunch the week after Halloween. I let my kids have a piece every day for a week. 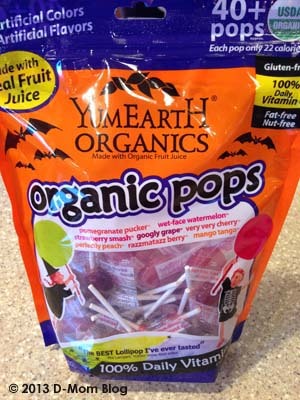 I found these lollipops and fruit gummies. They are organic and have no artificial flavors or colors and no nuts. They are also gluten-free and free of many common allergens. 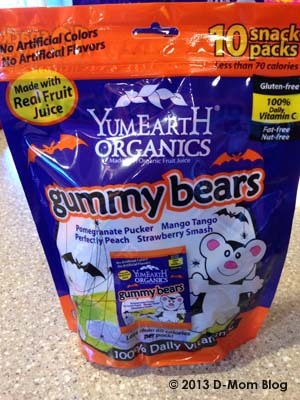 See the YumEarth ingredient list. 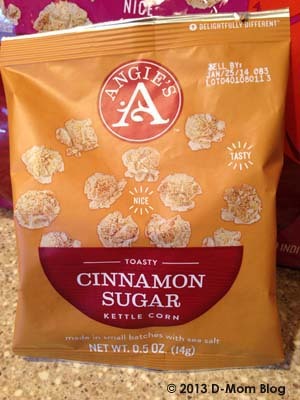 I frequently buy the Angie’s Boom Chicka Pop and put a handful of it in my kids’ lunches. I like it because it is dairy and nut-free and safe for Q. I saw this large bag of individual pouches in the Halloween aisle at Target. Q doesn’t like the cinnamon flavor, but my son does. Q claims that candy corn is her favorite candy, which I find to be completely odd! 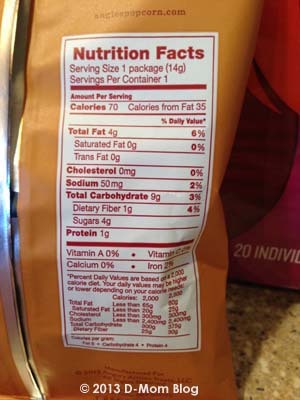 Brach’s candy corn has a cross-contamination warning for nuts. My son likes to decorate his train set for Halloween with candy pumpkins. I found Sunrise Harvest Mix at a dollar store. It is made in Mexico in a nut-free facility. The package says it is peanut-free. 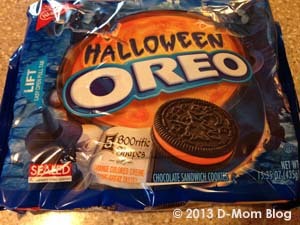 What treats do you stock up on for Halloween? Great ideas — Thanks! My son with T1 also has Celiac and a peanut allergy so these ideas are very relevant! I ordered a little treat from Vermont Nut Free Candies for him. My kids trade candy in for coins, keeping 10 pieces or so for themselves.